First we have Zoey's (and Jen's) dolls and starting in the back row from left to right we have: Zoe, Kristen, Elizabeth, Claire, Bella, Junie, Julie and then on either side we have McKenna and Rebecca and in the front is our Bitty Baby, Lucy. Jen's love of American Girl dolls didn't start until late in life since she didn't even know that they existed when she was younger! When Zoey's grandmother gave her Lucy (Bitty Baby) when she was just two we started getting American Girl catalogs in the mail and I began to become aware that they existed...fast forward several years to when Zoey turned six and she received her first 18 inch American Girl doll from her other grandmother for her birthday gift and that's really when the love of dolls officially took root. From then on we've been busy thinking of fun things to do with Zoey's doll(s) and have come up with many fun things to make for them and do with them. It's safe to say that we have bitten by the doll love bug here! They are a very special part of our family now. Amanda's love for American Girl dolls began when Santa brought her Kirsten in 1984. Samantha was Amanda's sister's doll from the same year. She remembers getting the American Girl catalogs, and really wanting Felicity when she was first introduced! In 2010, Santa's elves repaired Kirsten's broken leg, and he gave her daughter (Gracie) her very first American Girl Doll! Tracie and Angellee in the back row are 20" My Twinn brand dolls. 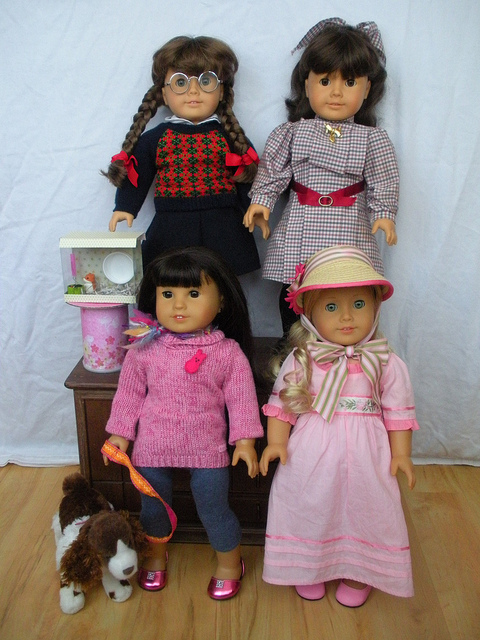 Alice, with the red hair, was Amanda's youngest daughter's first 18" doll; she is an Our Generation doll from Target. Last June Amanda and her girls (along with Zoey and Jen) took their fist trip to the American Girl Doll store at the Mall of America. Gracie picked out Julie and Lily got her first American Girl doll Ivy. It was such a great time and we all have such wonderful memories from the trip! And finally, we have Misty and Ruby's dolls...Ruby's first doll was a Just-Like-You which she named Crystal and is pictured in the bottom row on the left. Her next doll she got this past Christmas (2012) was the lovely Caroline Abbott. Shortly after, for her birthday she received Molly and Samantha (2012). Ruby's dolls have a pet dog and a gerbil which are both pictured as well. Aw, that's sweet. Have a nice day! What a good way to show your dolls. Taking "family" photos is so much fun! But who R the other people mentioned? BTW, I have 2 names on here. ACM and Abby12. From now on I will use Abby12. 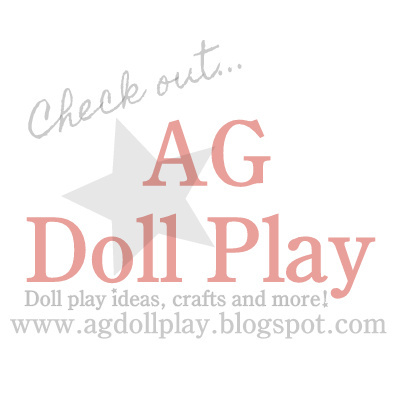 Didn't you get some new dolls at the AG Benefit sale? Hannah, I will update Zoey's family here this week (it's something that's been on my list). Perhaps Amanda will do the same, though I know that some of her dolls are being saved for birthday and Christmas gifts! :) Thanks for inquiring! I wish I had so many dolls like you do.They are beautiful! I have 8 dolls, their names are Hannah, Sarah, Saige, Mckenna, Lanie, Rebecca, Claire and Bethany. All of your guy's dolls are so cute! I especially like Molly and Zoe. Are your doll families updated? My daughter keeps wondering if there are new dolls! Are you going to update? cause their have been some dolls in posts that i don't recognize. I also wonder if their are new dolls! I just got my 5th doll 30m ago. Seriously, the FedEx truck arrived a while ago with my beautiful Samantha Parkington. My Name is Gracie ! And my sisters name is Ruby !